It was probably the French chemist Portes, who first reported in 1880 that the mucin in the vitreous body, which he named hyalomucine, behaved differently from other mucoids in cornea and cartilage. Fifty four years later Karl Meyer isolated a new polysaccharide from the vitreous, which he named hyaluronic acid. Today its official name is hyaluronan, and modern-day research on this polysaccharide continues to grow. Expertly written by leading scientists in the field, this book provides readers with a broad, yet detailed review of the chemistry of hyaluronan, and the role it plays in human biology and pathology. Twenty-seven chapters present a sequence leading from the chemistry and biochemistry of hyaluronan, followed by its role in various pathological conditions, to modified hylauronans as potential therapeutic agents and finally to the functional, structural and biological properties of hyaluronidases. 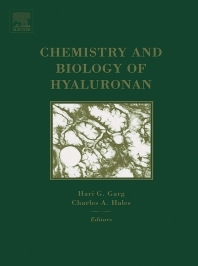 Chemistry and Biology of Hyaluronan covers the many interesting facets of this fascinating molecule, and all chapters are intended to reach the wider research community. Essential reading for chemists, biochemists, glycoscientists, medical professionals, students and researchers seeking a comprehensive overview of the many interesting facets of hyaluronan research. Solution Properties of Hyaluronan (T. Hardingham). Methods for Analysis of Hyaluronan and its Fragments (Ishan Capila, Ram Sasisekharan). 3.Methods for Determination of Hyaluronan Molecular Weight (M.K. Cowman, R. Mendichi). Biodegradation of Hyaluronan (G. Lepperdinger et al.). The Hyaluronan Receptor: CD44 (W. Knudson, R.S. Peterson). The Role of the Hyaluronan Receptor RHAMM in Wound Repair and Tumorigenesis (C. Tolg et al.). Signal Transduction Associated with Hyaluronan (R.M. Day, M.M. Mascarenhas). Structural and Functional Diversity of Hyaluronan-Binding Proteins (C.D. Blundell et al.). Biological Function of SHAP-Hyaluronan Covalent Complex (Lisheng Zhuo et al.). Hyaluronan and Associated Proteins in Visual System (Masahiro Zako, Masahiko Yoneda). Hyaluronan in the Pulmonary Alveolus and Interstitium (B.A. Bray). Hyaluronan in Ventilator -induced Lung Injury (H.G. Garg et al.). The Role of Hyaluronan in Cancer (Sonal Patel, M.J Page). Hyaluronan in Atherosclerosis and Restenosis (T.N. Wight et al.). Hyaluronan in the Airways (R. Forteza et al.). Hyaluronan Biology in Vocal Fold Morphology and Biomechanics (S.L. Thibeault). Hyaluronan in Aging (M.O. Longas). Hyaluronan and Scarring (A. Burd). Hyaluronan in the Epidermis and Other Epithelial Tissues (R.H Tammi, M.I. Tammi). Viscoelastic Properties of Hyaluronan and its Therapeutic Use (E.A. Balazs). Medical Applications of Hyaluronan (A. Asari). Therapeutic Biomaterials from Chemically-Modified Hyaluronan (Xiao Z. Shu, G.D. Prestwich). Medicinal Uses of Modified Hyaluronate (R.J. Miller, L.Z. Avila). Hyaluronan in the Treatment of Ocular Surface Disorders (P. Aragona). The Hyaluronan Synthases (P.H. Wiegel). Molecular Genetic Dissection of Hyaluronan Function in the Mouse (A.P. Spicer, J.Y. Lee Tien). Functional, Structural and Biological Properties of Hyaluronidases (G. Lepperdinger, G. Kreil).